• As you read the material in this chapter, keep Themes 1 and 2 in mind. The visual system adapted to allow us to function in a world filled with electromagnetic energy (consistent with Theme 1). Moreover, as we look out at the world, our visual field is filled with all sorts of useful information, which our visual system has evolved to perceive (consistent with Theme 2). Consider the challenge facing the visual system. It must process a wide range of wavelengths under a huge range of intensities. How has our visual system evolved to allow us to see certain wavelengths (and not others)? How has our visual system evolved to allow us to see under very dimly lit conditions and under very brightly lit conditions? • Even though this chapter focuses on the anatomy and physiology of the visual system, don't forget that subsequent chapters will flesh out complexities of visual processing. For instance, although this chapter will focus on the structures that support bottom-up processing, later chapters will make clear the essential ambiguity of the stimuli and the important role of cognitive processes (and top-down processing). • Because they are both optical instruments, occasionally we will compare the eye to a camera. Keep in mind that we do so to provide you with connections between a camera (with which you may be familiar) and the eye (with which you may be less familiar). Even as we make such a comparison, we recognize the weaknesses of doing so. One problem is that thinking of the eye as a type of camera leads to the mistaken notion that the purpose of the eye is to create a clear image (as on a high-definition screen) somewhere in the brain. If so, then you'd have to posit some little person inside your brain (a homunculus) to perceive the image created. (And then you'd have to determine how the visual system of the homunculus operates!) Another problem is that a (simple) camera passively records the light energy falling on its "film," whereas the visual system actively processes the visual input. As you learn more about the visual system, you should be driven to an increasingly complex and sophisticated understanding of visual perception. 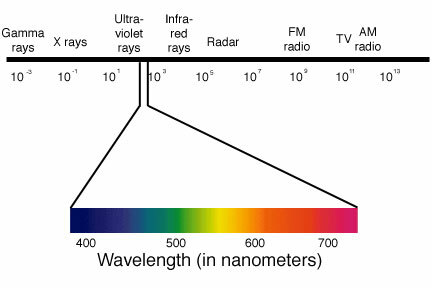 Link - You can learn more about the electromagnetic spectrum at the NASA site, including information about infrared rays. Link - Various sites contain resources about eye anatomy, including: The Cole Eye Institute, Macula.org, and Lensshopper.com. Link - To learn more about the physics/optics of light in the eye, check out the tutorials (especially Lesson 6 on the eye) produced by the folks at Glenbrook (IL) H.S. You can also find useful information about the physics of light and vision at the HyperPhysics site. Link - You can learn about the eyes in different animals at the BioMedia Associates site. • Sclera The sclera is the white membrane that is visible when you look at someone's eye. The sclera is rigid, but not hard, so its shape is maintained by the pressure exerted by the fluids it contains (like a thick round balloon filled with water). The muscles that allow us to move our eyes are attached to the outside of the sclera. • Cornea It is crucial that light be brought into focus on the retina. The cornea and the lens work together to bend the light to bring it into focus on the retina. The amount of bending (refraction) may be measured in diopters. In a very young person, the total refraction may be as much as 60 diopters, with 40 diopters (2/3's) due to the cornea. As we age, however, the lens becomes less flexible, so it is less able to bend light. Thus, for most adults, the lens's contribution may be substantially less than 20 diopters. Because the cornea's refractive power remains stable while the refractive power of the lens decreases, as one ages the proportion of light bent by the cornea becomes an increasingly large proportion of the total light-bending capability of the eye. • Both the cornea and the sclera are comprised of collagen fibers. However, the fibers in the cornea are much thinner (about 30 nm in diameter) and highly organized. Collagen fibers in the sclera are variable in size, but thicker (up to 150 nm in diameter) and not as highly organized. Hence, the cornea is clear and the sclera is relatively opaque. The cornea makes up roughly 15% of the outer eye and the sclera makes up the rest. Link - You can learn more about the cornea and corneal disease at the National Eye Institute site. • A number of surgeries (e.g., radial keratotomy or RK, photoreflective keratectomy or PRK, and laser in situ keratomileusis or LASIK) have been developed to correct refractive error by reshaping the cornea. However, some people have reservations about such procedures, especially the long-term consequences (because these are all relatively recent surgical developments). See, for example, Chapter 8 of Clyde Oyster's comprehensive textbook The Human Eye: Structure and Function. Link - You can easily find sites advocating such surgeries, but you may also want to check out a site for people whose outcomes were not positive. • Astigmatism An astigmatism means that the cornea is misshapen, which leads to a blurring of vision. 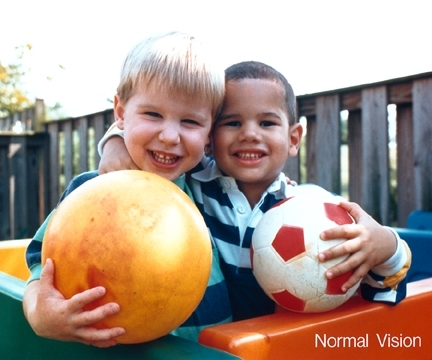 Astigmatism can typically be treated with an external lens. Link - You can learn more about astigmatism at the Mayo Clinic site or the All About Vision site. • Anterior Chamber Because the cornea doesn't contain blood vessels, it is supplied with nutrients by the aqueous humor ("watery fluid") filling the anterior chamber. Because the aqueous humor is typically so clear, less-clear aqueous humor is a sure sign of a problem. The aqueous humor is continually replaced, meaning that you have completely new aqueous humor in your eyes about every two hours (though replacement takes place more rapidly during the day). • Glaucoma Glaucoma results in damage to the optic disc (in the retina), which causes vision loss (typically first in peripheral vision). The damage is likely caused by a build-up of pressure within the eye. The intraocular pressure in your eye can be assessed through tonometry (e.g. applanation tonometry using a Goldmann tonometer). For people who don't have glaucoma, median intraocular pressure is slightly higher in women (16.5 mm Hg) than in men (15.4 mm Hg). There are two general types of glaucoma, determined by the way in which the aqueous humor is blocked. The most common type is open-angle glaucoma, in which there are abnormalities in the routes by which the aqueous humor leaves the anterior chamber (e.g. trabecular meshwork and the Canal of Schlemm). The other general (but far less common) type is closed-angle glaucoma, in which the lens and iris are pushed up towards the cornea, which prevents the aqueous humor from reaching its normal escape route. The onset of symptoms is much more rapid (and painful) in closed-angle glaucoma. Link - The National Eye Institute has a page devoted to glaucoma. Link - You can learn more about glaucoma at the Glaucoma Research Foundation site and at the All About Vision site. 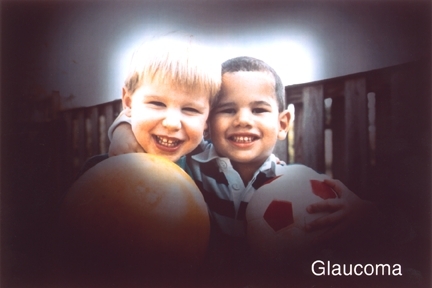 Link - Glaucoma can affect younger adults. For example, it cut short the career of Hall of Fame baseball player Kirby Puckett (1960-2006). Thus, it is crucial to receive routine eye examinations. • Iris/Pupil Light enters the eye through the pupil -- an opening in the middle of the iris, which gives our eyes their distinctive color. The pupil opens wider (dilates) in dim light and closes down (constricts) in bright light through Whytt's reflex. Dilation and constriction of the pupil arise due to the two sets of muscles in the iris. The sphincter muscles (which run in circular arcs around the pupil) contract to constrict the pupil. The dilator muscles (which run in radially from the pupil) contract to dilate the pupil. Demonstration 3.1 Iris and Pupil Size This demonstration illustrates how your pupil size varies with the ambient light. Go into a very dark room or closet with a door that can be opened to let in a little light. Take a hand mirror and a flashlight with you. Open the door just enough so that your left eye (next to the door) can see your right eye (away from the door opening) in the mirror. Notice the size of your pupil. It should become increasingly large as you adapt to the dark. Now turn on the flashlight so that it beams directly on your right eye. Watch how rapidly the pupil shrinks in size because the iris is closing up. Then turn off the flashlight and watch the pupil dilate. • Lens The lens changes shape through a process called accommodation. When focused on distant objects, the lens is relatively flat (less bending of the light). When focused on nearby objects, the lens is relatively thick (more bending of the light). Accommodation occurs reflexively in an effort to reduce the blurring of an image on the retina. • Presbyopia Presbyopia (literally "old eye") is typically detected around age 45, when people find it more difficult to focus on nearby objects. Due to the thickening and hardening of the lens that naturally occur over time as layers are added, the lens becomes less able to accommodate. 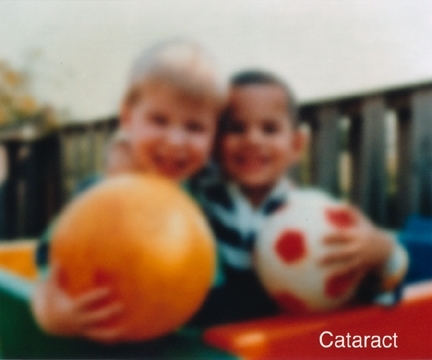 • Cataract One defect that can occur in the lens is a cataract (cloudy lens). This defect is more prevalent in older people, occurring in over 50% of people older than 65 and 70% of those older than 75. Link - Cataracts are more prevalent than average in Tibet and Nepal, which may be due to exposure to the sun at higher elevations (due to less filtering of the light). You can learn more about an effort to treat this problem in a documentary by Isaac Solotaroff (Visioning Tibet). • Retina The retina is located along the back of the eye. Transduction of electromagnetic energy into neural energy takes place in the retina, due to the activity of the photoreceptors (rods and cones). The retina is essentially transparent (the better for light to pass through) and ten layers are identifiable within the retina, with the photoreceptors located in a layer near the back. The retina is only 250 microns (micrometers, or millionths of a meter) thick. Later, we will focus primarily on the photoreceptors and the cells that then function to process the visual stimulus. Link - You can find a number of useful facts about the retina at WebVision as well as Lance Hahn's retina site. • Fovea The fovea is an area of densely packed cones located within an area of the retina referred to as the macula (or macula lutea), which is yellowish in color. The fovea is quite small (1.5 mm diameter), with an even smaller inner area (.5 mm diameter) that is entirely free of rods. Another way to think of the fovea is that it represents about 5 degrees of visual angle. The rod-free part of the fovea represents about 1.5 degrees of visual angle, which is about the size of your thumbnail when you fully extend your arm in front of you. • The fovea provides us with the greatest acuity, with decreases in acuity as you move away from the fovea. For example, as you read one word on the screen, the words to either side are increasingly difficult to read without moving your eyes. Try it! You might also try the demonstration below. Demonstration 3.2 Poor Visual Acuity Away from the Fovea As you focus your eyes on a target, you are essentially placing the target on your fovea. For this demonstration, close your left eye and focus on the plus sign at the center of the display below and move so that you're about five inches away from the screen. Then, without moving your eyes, see if you can read the letters to the left or the right of the plus sign. The fact that you can see the plus sign clearly, but have increasing difficulty reading the letters to the left of the center of the display is an indication that you're dependent on your fovea for clear vision. (Note, also, that colors are more difficult to distinguish as they appear in your peripheral vision.) Because they are larger, you may be able to read the letters to the right of the plus sign without moving your eye. • Blind Spot After it is transduced in the photoreceptors, the information leaves the eye via the ganglion cells exiting at the optic disc. You should recall that this is the area where glaucoma has its impact, causing cupping and damage to these neurons. However, because the optic disc cannot contain any photoreceptors, we cannot actually see any light energy that falls on this area of the retina. To demonstrate that for yourself, follow the directions below. Demonstration 3.3 Blind Spot We'll explore the blind spot in greater detail with a demonstration in Chapter 4. For now, let's simply demonstrate the existence of the blind spot. As seen in the figure of the eye above, at the optic disc the ganglion cells leave the eye, which means that there are no photoreceptors in that part of the retina. (You might give some thought as to why you don't see a "hole" in the world as you look around you.) To experience this demonstration, close your left eye and use your right eye to look at the X below. Gradually move closer to or further from the screen (within a range of 4 to 16 inches). At some point you will reach a distance at which the black spot below seems to disappear. At this distance, the spot is falling on your blind spot. Alternatively, to get a sense of its size, you might want to map your blind spot [Serendip site]. • Vitreous Humor The posterior chamber is filled with vitreous humor, which is gel-like and therefore thicker than aqueous humor. The vitreous humor helps maintain the shape of the eyeball. • Choroid The choroid is a layer just behind the retina that contains blood vessels that supply nutrients to the retina. Because the choroid is dark, it can also absorb light energy that isn't absorbed by the retina, thereby minimizing the amount of stray light bouncing around the eye. The choroid is what you're seeing in a flash photograph that exhibits red-eye. • Tapetum Instead of a choroid, nocturnal animals may have a tapetum, which is a reflective membrane behind the retina. Given the problems created by stray light bouncing around the eyeball, you can imagine that the tapetum works against clear vision in bright daylight. To minimize such stray light, during the day these creatures are able to shut down their pupils to an aperture much smaller than humans are able to achieve. At night, however, the tapetum bounces any stray light back to the photoreceptors, giving them a second chance to detect the incoming light. 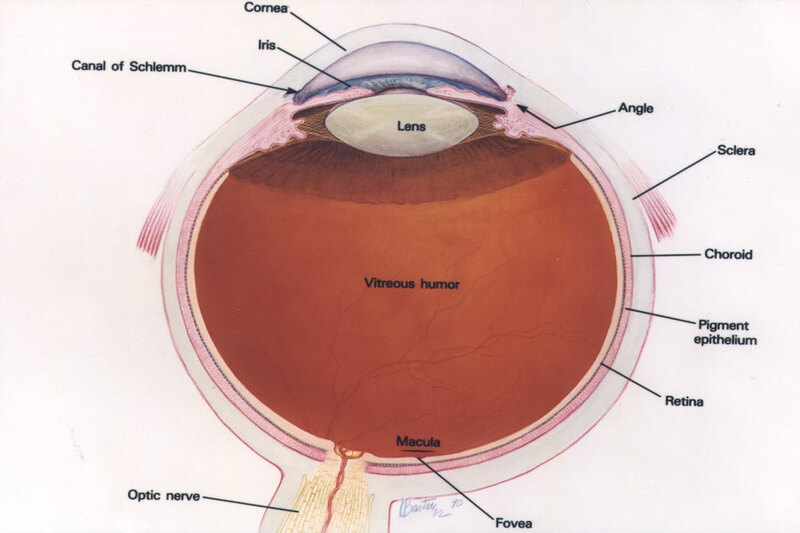 Below is a highly schematic view of the retina. You'll note the two types of photoreceptors (rods and cones), the bipolar cells to which the photoreceptors send information, and the ganglion cells to which the bipolar cells send information. The ganglion cells then carry that information beyond the eye. You should also note the cells that provide lateral information (the horizontal cells and amacrine cells). • Rods and cones are distributed differently, as seen in the figure below. Note that the cones are concentrated in the fovea, while the rods are concentrated just outside of the fovea. In fact, there's an area right in the middle of the fovea in which rods are completely absent. Because rods are more sensitive than cones, under dimly lit conditions it's best to look just to the side of the object of interest. Doing so will place the image of the object on the part of the retina that is rich in rods, as illustrated in the demonstration below. Demonstration 3.4 Night Vision and the Fovea Choose a clear night and find a place with no bright lights nearby. Look up at the stars and locate a very dim star. You should find it easier to locate the dim star if you look just to the left or right of the star. If you then look directly at the star, you should note that it gets even dimmer or may even disappear from view. Under such dim viewing conditions, rods operate but cones do not. If an object is registered on the areas of your retina rich with rods, you can see it; that is, you can best see objects that are slightly outside the fovea. If the image of an object falls on the fovea, which is rich in cones, you cannot see it well, or at all! Consequently, at night you can actually detect dimly lit objects better if you don't look directly at them. 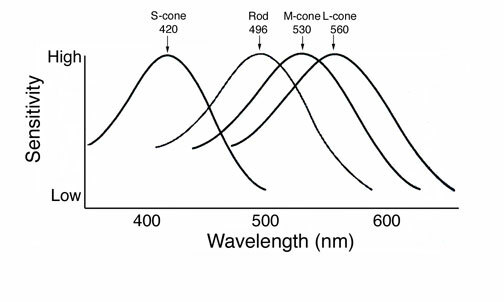 • Rods and cones are sensitive to different wavelengths. As you can see in the figure below, rods are maximally sensitive to about 500 nm. [Keep in mind that regardless of the wavelength, rods will provide you with only achromatic vision (shades of gray from black to white).] The maximum sensitivities noted below are only approximations, so you'll find (many) different values in different places. • Dark adaptation differences. The cones adapt to a shift to dim light very rapidly, becoming more sensitive. However, their ability to adapt is limited. The rods also immediately begin to adapt to a shift to dim light, but they are slower to become more sensitive. This is one case in which the race does not go to the swift, so the rods eventually exhibit much greater sensitivity than the cones. Demonstration 3.5 Dark Adaptation Find a flashlight that is opaque on all sides except where the beam of light shines through. Take about 15 index cards and the flashlight and go into a dark room where you can stay for 15 to 20 minutes. Place all the index cards tightly over the beam of light. Remove the cards one at a time until you can just barely see the light. Count the number of cards that you've removed, so that you know how many are remaining. After a few minutes, the light will look brighter to you. Add a card and see whether you can still see the light. If not, wait another minute and try again. Keep repeating the process for 15 more minutes. Notice that as you spend more time in the dark, you can detect an increasingly dim light. Link - You can learn more about dark (and light) adaptation at the Web Vision site. - midget ganglion cells (which receive input from midget bipolar cells) [P pathway] The midget ganglion cells are the most numerous in the retina (70-80%), but particularly within the fovea, where they will typically receive input from only one midget bipolar cell. - parasol ganglion cells (which receive input from diffuse bipoar cells) [M pathway] Parasol ganglion cells are far less numerous than midget ganglion cells (~10%). Link - If you need to review (or quickly learn) about the functioning of neurons, you can make good use of the module on neurons at The Mind Project site. Link - You can also find a great review of neuron functioning at John Krantz's site. Link - The Neitz Lab has provided a number of interesting illustrations, including a demonstration of the processing of color information in the retina. You can see predictions of ganglion cell output given different wavelengths of input. • Horizontal Cells There are two types of horizontal cells (HI and HII). These cells play a crucial role in creating receptive fields and in lateral inhibition, due to inhibitory connections. • Amacrine Cells Santiago Ramon y Cajal (1852-1934) was the first to report amacrine cells, though he mistakenly thought that they contained no axons. There are more than 30 different types of amacrine cells, though they are distinguished primarily on the basis of shape or neurotransmitter rather than function. One type of amacrine cell (AII -- "A two") is responsible for passing rod bipolar cell input to cone bipolar cells, where it then flows to the ganglion cells. Other amacrine cells play important roles in modifying the flow of visual information, such as creating some ganglion cells that are sensitive to object motion that differs from background motion. • The figure above is a view from the bottom of the brain (Thanks, Jasper!). 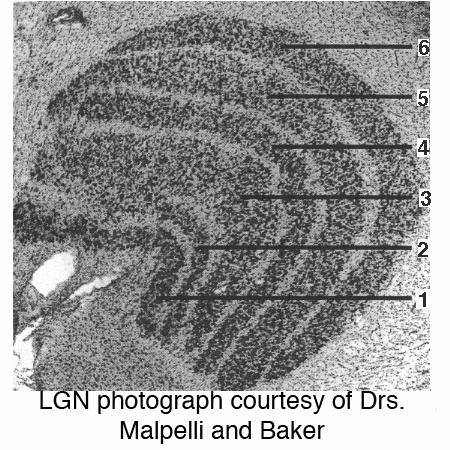 As seen in the figure, information from the left eye (solid lines) and right eye (dashed lines) leaves via the ganglion cells and goes to the lateral geniculate nucleus and then the visual cortex. Some information also goes to the superior coliculus. • Optic Chiasm Information from the right side of both the left and right retinas (the right hemi-retina, which gets information from the left visual field) goes to the right lateral geniculate nucleus. That information path is shown in blue. 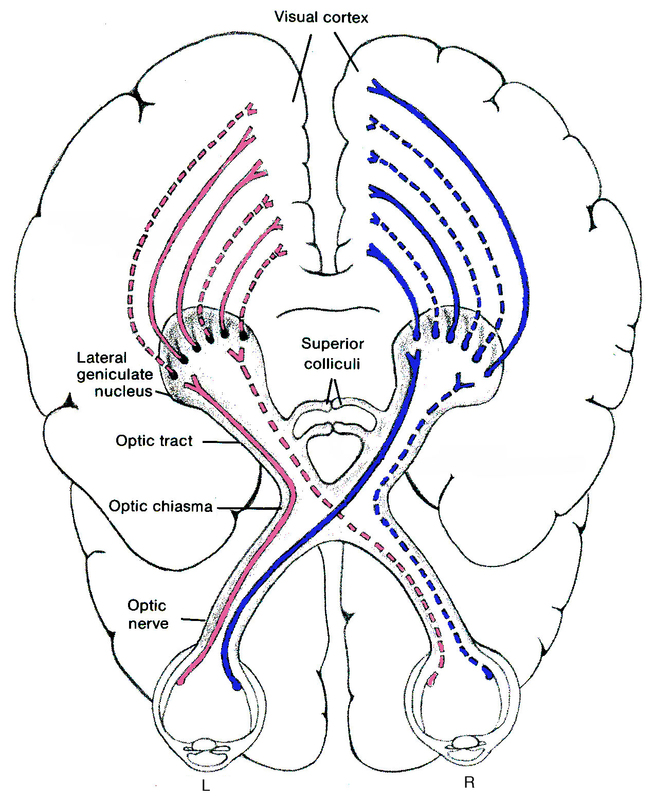 Information from the left side of both the left and right retinas (the left heni-retina, which gets information from the right visual field) goes to the left lateral geniculate nucleus. That information is shown in pink. Thus, at the optic chiasm you can see a cross-over of information. Information from the left hemi-retina of the left eye doesn't cross over, but information from the left hemi-retina of the right eye crosses over at the optic chiasm so that it can go to the left lateral geniculate nucleus. Information from the right hemi-retina of the right eye doesn't cross over, but information from the right hemi-retina of the left eye crosses over at the optic chiasm so that it can go to the right lateral geniculate nucleus. • Three Parallel Visual Pathways There are three parallel visual pathways that originate in the retina and continue to the visual cortex (and to a degree beyond the visual cortex). The P pathway is driven by cone input to midget bipolar cells and midget ganglion cells, so it plays an important role in color perception and in providing acuity. The M pathway is driven by cone input to diffuse bipolar cells and parasol ganglion cells, so it plays an important role in motion perception. The K pathway is driven by S-cone input to S-cone "on" bipolar cells and the small bistratified ganglion cells. The K pathway seems to be involved in comparing S-cone input with input to M- and L-cones. • Lateral Geniculate Nucleus (LGN) Most of the ganglion cells in the optic tract terminate in the LGN, found in the thalamus. The LGN is comprised of 12 layers, with input from each eye kept separate in layers (at least in the projections from near the fovea). There are two M pathway layers (one from each eye), four P pathway layers (two from each eye), and six K pathway layers (three from each eye). 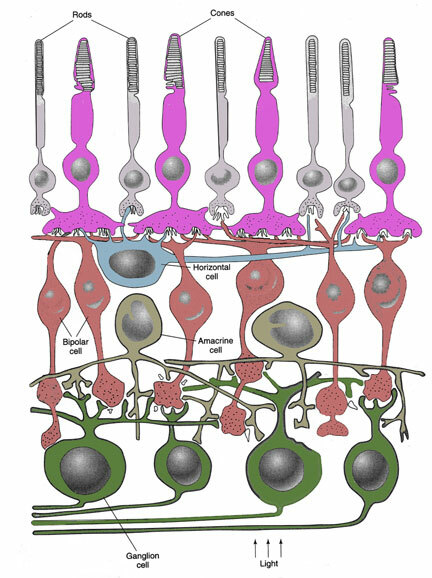 As seen in the schematic depiction below, the input from the ganglion cells coming from the eye on the same side of the head as the LGN (ipsalateral) are colored in pinkish colors for the P and K pathways and in dark gray for the M pathway. Input from the ganglion cells coming from the eye on the other side of the head (contralateral) are colored in bluish colors for the P and K pathways and in light gray for the M pathway. The photograph to the right is labeled correctly, though the numbers are in error in the textbook (Figure 3.18). [Thanks to Scott Parker, Rene Verry and others!] There are a number of connections to the LGN from other areas of the brain, making the LGN a site where the visual imput from the eye is affected by the other incoming information before it flows to the visual cortex. • Superior Colliculus The superior colliculus receives input from ganglion cells with large dendritic fields (larger than those found in parasol ganglion cells). Researchers have identified at least three different types of ganglion cells projecting to the superior colliculus. The superior colliculus also receives input from other perceptual areas and seems important for integrating spatial information from various senses. The superior colliculus plays an important role in controlling eye movements. Link - You'll find information and illustrations of the superior colliculus at the University of Wisconsin site. Link - You'll find an excellent summary (with lots of detail) about the visual cortex at WebVision, courtesy of Matthew Shmolensky. • Below is a simplified pictorial summary of some of the paths (e.g., direct V1->V4 and V1->V5 links are not displayed) of visual information from the LGN through V1 and then beyond. • The Where Pathway The Where pathway is fed by M pathway input, so it is concerned with motion perception. (It's also called the motion pathway.) This pathway is also called the dorsal (upper) pathway, because it goes up into the parietal cortex. • As seen in the figure above, V5 (or MT) is one area of the brain that is crucial for processing motion information. Damage to this area may result in akinetopsia, which is an inability to perceive fluid motion. 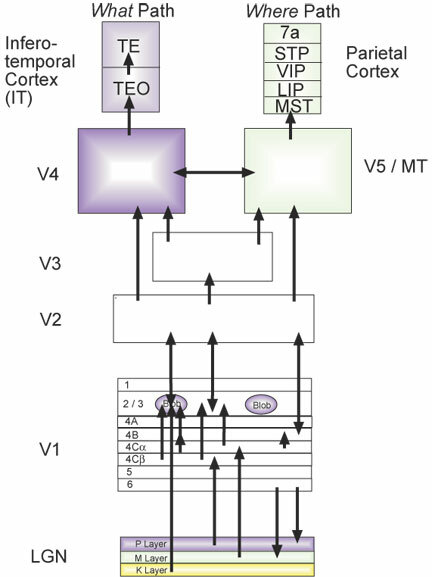 The Where pathway flows from V5 toward the parietal cortex, where a number of distinct areas play roles in processing the motion information, as well as linking to the What pathway. • The What Pathway The What pathway is fed by P pathway input, so it is concerned with the perception of shape and color. This pathway is also called the ventral (lower) pathway, because it goes down into the inferotemporal cortex. • As seen in the figure above, V4 is one area of the brain that is crucial for processing color and shape information. V4 is probably not the color perception area, though it is clearly involved in processing color information. Damage to V4 may result in cerebral achromatopsia, which is an inability to see colors (only shades of gray). From V4, information flows to IT, where neurons have very complex receptive fields that play important roles in object perception. Damage to IT results in a number of interesting disorders, including agnosia and prosopagnosia. • Agnosia (from the Greek for "no knowledge") occurs in several varieties. Visual object agnosia refers to an inability to name an object when seeing it (or a picture of it). People with this disorder can see clearly, so the deficit is not due to a loss of vision. In fact, when people with visual object agnosia can draw well, they can draw a picture of the object from memory or draw a picture of the object in front of them. Nonetheless, they cannot tell you what the object is, even after drawing it! Link - Donald Kline (University of Calgary) has provided a page that describes various visual agnosias. • Prosopagnosia (from the Greek for "no face knowledge") is a disorder in which a person is incapable of identifying a person when seeing that person's face (or a picture of the person's face). Acquired prosopagnosia emerges due to damage to a portion of IT called the fusiform face area (FFA). Developmental prosopagnosia (also called congenital prosopagnosia) is a genetic disorder (relatively uncommon, but found within families). Link - Brad Duchaine (University College of London) is a researcher who is particularly interested in developmental prosopagnosia. The site contains information on prosopagnosia as well as relevant publications of people working in this area and links. • Researchers have learned a lot about how the brain functions to process visual stimuli. At the same time, many controversies remain -- as well as areas that simply need more research. Thus, if you find yourself intrigued by this area of psychology and neuroscience, you should imagine that a lot of room remains for you to make your mark on the field. • Some of the questions seem to be as much philosophical as scientific. For instance, we can dismiss the notion of the homunculus (and the notion of vision as putting a detailed image somewhere within the brain). How, then, do we characterize visual perception? We certainly see (and hear, and feel, ...) the world as a result of sensory transduction and resultant brain activity. But how does our unified perceptual experience of the world emerge. We can characterize the problem as one of binding together the activity in quite distant areas of the brain. Having done so, however, does not necessarily move us closer to understanding how it all happens. Some clever researcher(s) will one day unlock that problem (and others)...maybe you'll be one of them. 1. The beginning of the chapter discussed the visual stimulus. List the three pairs of attributes that are concerned with light, specifying which member of the pair concerns the physical stimulus and which concerns the psychological reaction. What psychological reaction do we have to (a) short wavelengths, (b) long wavelengths, (c) low-amplitude wavelengths, and (d) high-amplitude wavelengths? 2. Discuss the portion of the electromagnetic radiation spectrum that humans can see. Discuss differences among species with respect to the part of the spectrum to which they are sensitive and the nature of the photoreceptors. 3. Review the location and the function of the following: sclera, iris, pupil, cornea, and lens. Describe how light is focused on the retina. 4. What is the fovea, and where is it? 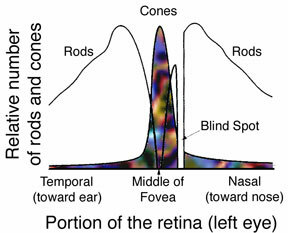 How is the distribution of cones and rods relevant to a discussion of the fovea? Compare acuity in the fovea and nonfovea regions of the retina. Then compare sensitivity in these two regions, noting how the issue of convergence is relevant. 5. Rods and cones differ in a number of ways. List as many differences as you can. Compare the process of dark and light adaptation for cones and rods. Try to think of practical applications of both processes (devising brightness and color spectrum of lights along highways, preserving dark adaptation for drivers, etc.). 6. Ganglion cells in the retina were discussed in some detail. Can you describe the differences among the various types of ganglion cells? Ganglion cells are similar in the shape of their receptive fields. How does the shape of their receptive fields differ from cells later in the visual pathway? 7. The arrangement of the neurons in the lateral geniculate nucleus and in layer 4C of the visual cortex was described as retinotopic. Discuss this term in relation to those two areas. 8. 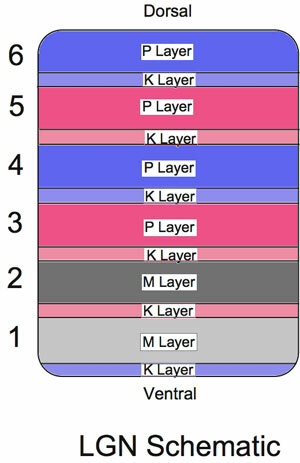 What is the function of neurons in the remaining layers of V1, above and below layer 4C? How could such simple and complex cortical cells arise from the input found in layer 4C? How do end-stopped cells differ? How do the blobs differ? 9. Damage to particular areas of the visual pathway often helps researchers understand the function of a particular area. Try to imagine the impact of damage to the following areas: the P pathway, the M pathway, the K pathway, all three pathways (P, M, and K), the ganglion cells going to the superior colliculus, V1, V4, V5, the pathway from V1 to the parietal lobe, or the pathway from V1 to IT. 10. Try to imagine and then describe the perceptual experience of a person with agnosia or prosopagnosia. Why would such people be capable of seeing detail? What does agnosia or prosopagnosia tell us about the organization of our visual systems? 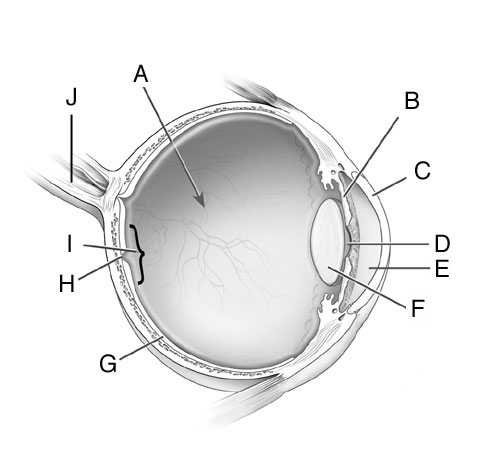 Can you correctly label the anatomical features of the eye? iKnow produces a useful CD called Physiology of the Eye, with interesting animation (it's like flying around inside an eyeball). American 3B Scientific has a number of different models of the eye, brain, etc. Denoyer-Geppert produces a whole range of three-dimensional models, including models of the eye. Especially useful is their demonstration of focusing in the eye (Rubin's Eye). Anatomical Chart Company also produces three-dimensional models and charts of the eye (and other structures). You can also purchase a gelatin mold of the brain. Yummy! Thomson Higher Education has published two very useful CD-ROMs. John Baro (Polyhedron Learning Media) has developed Insight: A Media Lab in Experimental Psychology [see Feature Analysis and Receptive Field Mapping] and Colin Ryan (James Cook University) has developed Exploring Perception [see Module 1]. Link - David Hubel wrote a good introductory book for Scientific American -- Eye, Brain, and Vision. He has an accompanying web site that contains the book and its illustrations. Link - PsychLab Online (John C. Hay, Professor Emeritus at University of Milwaukee-Wisconsin). Of particular interest for this topic is the program that simulates single-cell recording in the visual cortex of a cat (Feature Detecting Neurons). Students are presented with a reasonable simulation of the actual process of searching for the location and orientation of a line stimulus necessary to excite a particular neuron (including the tedium). Link - John Krantz (Hanover College) has developed a very helpful web site, with a number of demonstrations. For this chapter, you might benefit from perusing his page on receptive fields. He's also developing a number of helpful demonstrations, with many appropriate for the topics in this chapter (nature of light waves, impact of presbyopia, receptive fields, visual pathways, etc.). Link - Michael Mann (University of Nebraska) has placed his physiology textbook online, and it includes chapters (Chapter 4b and Chapter 7) that are relevant for the visual system. Link - Lance Hahn (Western Kentucky Univeristy) has developed some very useful pages to provide information about the eye and the retina. Link - The National Eye Institute maintains a very informative site that has a wealth of images (in a variety of resolutions) and videos that can be downloaded for class use. Link - The John Moran Eye Center of the University of Utah maintains a site called WebVision: The Organization of the Retina and Visual System (Kolb, Fernandez, & Nelson) that has evolved into a fairly comprehensive site, with new material added routinely. Link - The Smith-Kettlewell Eye Research Institute maintains a number of interesting pages, including Christopher Tyler's Eye Page, showing the eyes found in many non-human species. Check out their research page for other links. Link - The Schepens Eye Research Institute (Harvard University) has a useful glossary of vision terms as well as information about eye disorders. Link - The Eye Pathologist (Duke University) is an excellent site (with illustrations) for both normal and abnormal eye anatomy. You'll need to register (for free), but the process is simple. Link - Robert G. Cook (Tufts University) has edited a cyber-textbook on avian vision. Link - Diane Szaflarski has provided a very simple introduction to vision. Link - You'll find some interesting information provided by the Visual Sciences Group at the Indiana University School of Optometry. Link - The Vision Science site has become a compendium of links to vision researchers and related materials. Link - The Exploratorium has a demonstration of the dissection of a cow's eye, which provides some sense of the anatomy of the eye. Link - Although the topics are broader than vision, per se, you'll probably find the BBC 2003 Reith lectures by Vilayanur S. Ramachandran fascinating. You can listen to them or read the transcripts. Link - David Heeger (NYU) has a very useful lab web-site for basic visual processing, including reprints of his work. Link - The Archives of Ophthalmology maintains a useful site with access to some of its articles. Fain, G. L. (2003). Sensory transduction. Sinauer. Farah, M. J. (2004). Visual agnosia (2nd Ed.). MIT Press. Hubel, D. H. & Wiesel, T. N. (2005). Brain and visual perception: The story of a 25-year collaboration. Oxford. Livingstone, M. (2002). Vision and art: The biology of seeing. Harry N. Abrams. Kolb, H. (2003). How the retina works. American Scientist, 91, 28-35. Oyster, C. W. (1999). The human eye: Structure and function. Sinauer. Pinel, J. P. J. (2006). Biopsychology (6th Ed.). Allyn & Bacon. Riordan-Eva, P. & Whitcher, J. P. (Eds.) (2004). Vaughn & Asbury's General ophthalmology, 16th Ed. McGraw-Hill. Rodieck, R. W. (1998). The first steps in seeing. Sinauer. Sacks, O. (1998). The man who mistook his wife for a hat: And other clinical tales. Touchstone. Soderquist, D. R. (2002). Sensory processes. Sage. Wandell, B. A. (1995). Foundations of vision. Sinauer. Zeki, S. (1993). A vision of the brain. Oxford.